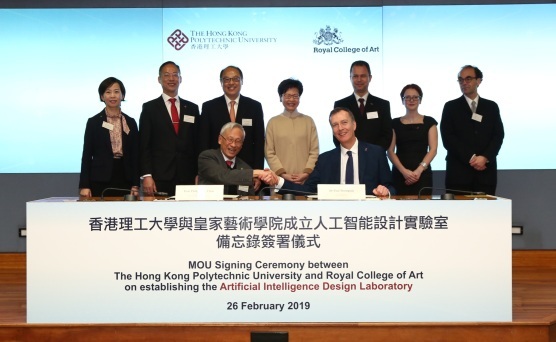 HUNG HOM, Hong Kong - Feb. 27, 2019 - PRLog -- The Hong Kong Polytechnic University (PolyU) and the Royal College of Art (RCA), United Kingdom, today signed a Memorandum of Understanding (MoU) to confirm their intention to establish the PolyU|RCA Artificial Intelligence Design Laboratory (AIDL). The Laboratory will be the world's first and leading research facility to advance the integration of Artificial Intelligence (AI) into the design of products and service. Targeted to uncover knowledge and techniques related to design and scientific principles, new design process and innovative products, AIDL will address industry demands for efficiency, automation and customising products and services in the innovation and technology era. Its research deliverables will support industries including healthcare, manufacturing, hospitality and retail services. The Hon Mrs Carrie LAM CHENG Yuet-ngor, the Chief Executive of the Hong Kong Special Administrative Region (HKSAR) attended the ceremony and witnessed the signing of MOU by Prof Philip C. H. CHAN, Interim President and Provost of PolyU and Dr Paul THOMPSON, Vice-Chancellor of RCA. Also joining the ceremony as witnesses were Dr LAM Tai-fai, Council Chairman of PolyU; Ir Prof Alex WAI, Vice President (Research Development); Dr Miranda Lou, Executive Vice President; Prof Naren BARFIELD, Deputy Vice-Chancellor and Provost of the RCA; Prof Juan Cruz, Dean of the School of Arts and Humanities and Ms. Helen PROTHEROE, Director of Development & Alumni Relations of RCA. Addressing in the ceremony, The Hon Mrs Carrie Lam, said, "The opportunity to witness this marriage of design and AI which belongs to the technology portfolio is extremely gratifying. I am sure that the collaborated team of PolyU and RCA will find in Hong Kong the appeal of time-tested legal system, robust intellectual property protection, strong financial sector, and the support for commercialisation of R and D results, as well as the distinctive east meets west culture which sparks creative inspiration." Prof Philip C. H. Chan said, "I am confident that this Laboratory will bring together the strengths of both institutions to lead the world in this new design paradigm, contributing to the innovation and technology development in Hong Kong and the Greater Bay Area." "Founded 182 years ago, in response to the first industrial revolution, the Royal College of Art (RCA) today stands at the turn of the fourth revolution. The world will witness breakthroughs across design and technology including artificial intelligence – where art and design will meet. As the world's number one art and design university, we have built our capacity to work across disciplines, combining our art and design research expertise with insights from science, technology and engineering. We are delighted to collaborate with The Hong Kong Polytechnic University to bring together unrivalled capabilities," said Dr Paul Thompson Vice-Chancellor of RCA. PolyU will engage researchers and resources from various disciplines including Department of Applied Mathematics, Department of Computing, Department of Industrial and Systems Engineering, Institute of Textiles and Clothing, Department of Mechanical Engineering and School of Design to work together with RCA on a number of theme-based research. Among them, there will be empirical research in Affective Computing and Social Robots that could recognise and analyse human emotions. Other studies will include Intelligent Fashion Design; Intelligent Textile and Apparel Design and Manufacturing; innovating materials of the future that are extremely light, robust and able to detect human bio-metrics for fashion and wearables; creating automatic systems for ergonomic design and human modelling, and using regenerative approach in product design and material development for sustainability in the circular economy, etc. Committed to supporting the HKSAR Government's InnoHK initiative in developing Hong Kong as the hub for global research collaborations, the two institutions has just submitted a proposal to the HKSAR Government under the AIR@InnoHK research cluster initiative.